teased with a trailer and making-of clip last February, is finally making its long-delayed bow on Blu-ray, hitting video store shelves right as Kenneth Branagh's live-action adaptation roars into theaters. I'm not sure I'd say Tales of Asgard is worth that long wait, exactly, but this is still a very solid story that approaches these familiar characters in an impressively unconventional way. impressed as I am with the way both of them are presented, the Warriors Three completely steal the movie, overflowing with personality and scoring all the best lines. 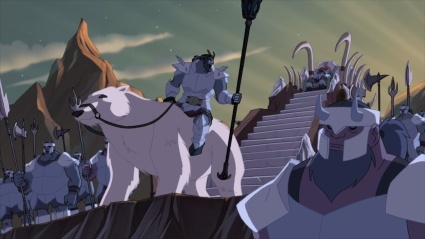 Also putting in appearances here are Odin himself, The Enchantress, a Fenris Wolf, the Dark Elf Algrim, Brunhilde, and the warrior goddess Sif, among many others. As sprawling as the cast is and as dense as the mythology can be, Thor: Tales of Asgard is never overwhelming. The point of it all is to introduce neophytes to the realm of Asgard, and the movie deftly juggles all of these many different elements and with a minimum of exposition to boot. The pacing is kept nimble with a constant sense of forward momentum too, so things never have a chance to drag. 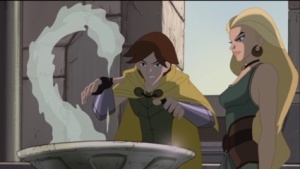 I'm also intrigued by how even-keeled Tales of Asgard is with these characters. There really is no overarching villain. There are characters who do terrible things, of course, be it willfully or out of ignorance, but there are no nefarious, moustache-twirling schemes or anything like that. Everyone is shown as having a sympathetic, justifiable point of view. Its primary interest is in showing the transformative effects of great power, and in keeping with that, the finalé even takes care to define heroism in terms other than people hitting each other. Even better, the movie manages to make these points in the scale of a colossal battle, never at all feeling preachy, heavy-handed, or anticlimactic. Thor: Tales of Asgard takes a lot of chances, presenting such familiar characters in very unfamiliar ways and veering away from the traditional superhero formulas. I mean, this is a movie where Thor is kind of a prick, can't fly, lacks any superhuman abilities, has never held his iconic stone hammer, and is the best of friends with a character we're so used to seeing as his mortal enemy. It's impressive enough that Tales of Asgard doesn't play it safe, but also that it pulls all of this off so well. There's an enormous amount of action, more Norse mythology is squeezed in here than I would've thought possible, and the mythos are never disorienting. This is just a remarkably well-constructed story. At the same time, the past few Marvel animated titles have felt like events -- like...well, movies. Even though Tales of Asgard builds to a climax where an army of Frost Giants lay siege on Asgard, there's just something about it that feels small. It plays like a chapter in the lives of these young characters rather than a satisfyingly complete beginning, middle, and end. One of the extras on this Blu-ray disc is a bonus episode of the Avengers cartoon, and really, Tales of Asgard doesn't seem any more cinematic or epic in scope than that. If someone were to tell me that this isn't a movie at all and is really just a three-episode arc of some Saturday morning Marvel animated series on Disney XD, I probably would've believed it. There's a nagging part of me too that thinks that I respect Tales of Asgard more than I enjoy it...that I find it more interesting to write about than to watch. I've seen almost all eight of these Marvel animated movies, and I think I'd rank Thor: Tales of Asgard right in the middle. If you've seen the live-action film and want to get another look at these characters from a completely different angle, then this Blu-ray disc is an easy recommendation. It's family-friendly without pandering to the kids, and that's appreciated as well. Much better than I expected, not quite as great as I wish it were, but still very much Recommended. 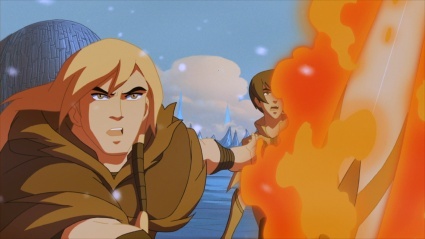 The linework of the animation is so much crisper and more richly defined in high-def. The DVD is dragged down by mosquito noise, compression artifacting, and even a little ringing around hard edges. This Blu-ray disc, on the other hand, is cleaner, smoother, and just more natural overall. The difference is even more apparent when the camera pulls far back to give viewers a sense of the scale and majesty of these very different realms. Tales of Asgard's colors are rendered flawlessly as well, with the palette tailored somewhat to each setting: frigid and bitingly cold in Niffelheim, for instance, and subdued like the pages of a slightly yellowed storybook throughout Asgard. Admittedly, the animation can be choppy, and the designs are somewhat simple and plain. That limits how much this Blu-ray disc can really impress, but at least as far as the technical end of this presentation goes, I'm really not left with any complaints at all. 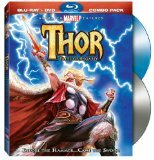 Thor: Tales of Asgard arrives on a single layer Blu-ray disc. The movie is presented at its original aspect ratio of 1.78:1 and has been encoded with AVC. don't have enough speakers to take full advantage myself, but it's still nice to see studios aim high. Every last element in the mix is rendered cleanly, clearly, and distinctly. From a brawl in a dingy bar all the way to war between the Asgardians and the Frost Giants, the low-end is consistently thick and meaty. The voice acting emerges flawlessly and is never overwhelmed, even with the gargantuan scale of the havoc wreaked throughout the movie. The sound design admittedly isn't big on pans across the soundscape, and that limits the immersion somewhat. 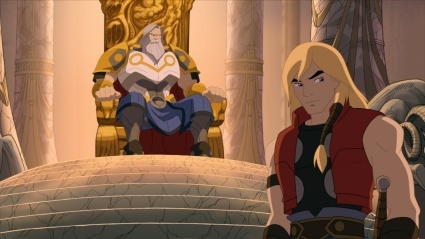 If you can look past that, though, Thor: Tales of Asgard takes better advantage of the multichannel setup better than most of Marvel's animated movies. The rears splash on plenty of atmospheric color, of course, such as the reverb throughout the cavernous halls of Asgard and the howling winds of Niffelheim. They also very effectively flesh out the scale and chaos of the many battle sequences, and haunting voices and swirling otherworldly energies also fill the surrounds at times. It's not quite as aggressive as I would've liked to have heard, but considering the target audience for a movie like this is probably watching it in plain-jane stereo, it's hard to grouse about what's offered here. Very nicely done. Also included is a Dolby Digital 5.1 dub in Spanish. Subtitles are limited to English (traditional and SDH) and Spanish. The Avengers: Earth's Mightiest Heroes Bonus Episode (23 min. 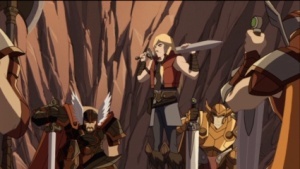 ; HD): While Thor: Tales of Asgard revolves around a teenaged Thor, this episode from The Avengers -- "Thor the Mighty" -- picks up with the Norse God already a seasoned hero. After squaring off against The Wrecking Crew on Midgard...err, I mean Earth, "Thor the Mighty" treads some kind of familiar ground. The Frost Giants are again laying siege to Asgard, this time under Loki's command. The supporting cast is much the same -- the Warriors Three, Sif, Balder, Heimdall, and The Enchantress, for starters -- and this time around we even get to see Thor fling around Mjolnir. This episode complements the movie really well, and I'm very glad to see that it's in high definition to boot. Usually bonus episodes seem to get short thrift on that end. Worthy: The Making of Thor: Tales of Asgard (22 min. ; HD): Tales of Asgard's making-of featurette breezes through pretty much everything: differentiating this animated movie from the live-action film they knew would be in the hopper, some of the specific comics that inspired them, how the premise took shape, melding 2D and 3D animation together so seamlessly, character design, distinguishing the look of Thor: Tales of Asgard from Hulk vs. Thor from a couple years back, the design of the title sequence, and even the approach to the score. There isn't anything on the voice acting, and the usual chats with the talents behind the comics are missing in action, but otherwise, this is a nicely comprehensive look at what it took to bring Thor: Tales of Asgard to life. with "Worthy" already having covered so many of the highlights, they're a little difficult to recommend to anyone but particularly rabid fans. The first commentary pairs together supervising producer Craig Kyle and screenwriter Greg Johnson, the two giant minds behind the story. The two of them have an enormous amount of personality that really propels this track along even though it too often falls into the trap of narrating rather than discussing. Among the standout notes here are a cameo by Wonder Woman director Lauren Montgomery, explaining where exactly Loki's magic words came from, pulling back on some of the more extreme imagery the animators overseas had dropped in, and running through some of the character moments that were snipped out of the finished script. Of the two commentaries, this one's easily my favorite. The other track features supervising director Gary Hartle, director Sam Liu, and character designer Phil Bourassa. As you might expect, while the first track focuses more heavily on character and story, this one emphasizes the look of Thor: Tales of Asgard: character design, costumes, colors, environments, and even a few visual touches I'd overlooked my first time through. I didn't find myself jotting down nearly as many highlights with this one, but it's still a reasonably fun listen, and I especially enjoyed hearing how artistically inspiring being near-death can be. There are also high-def trailers for a few of the other direct-to-video Marvel animated titles. The second disc in the set is a DVD of Thor: Tales of Asgard, and it's the same as the individually released retail copy, extras and all. I'm sure it's also worth pointing out the very striking cover art by Alex Ross that appears on both the Blu-ray insert and the embossed cardboard slipcover. 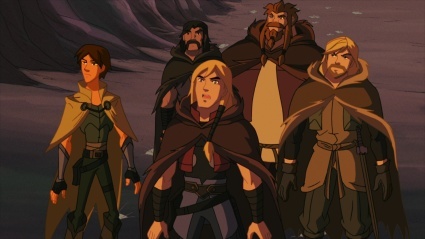 Thor: Tales of Asgard is the eighth and final movie in this line of direct-to-video Marvel animation, and it falls somewhere in the middle for me. Normally I'm not that keen on "when they were young" takes on characters I know and love, but I really did enjoy seeing Thor and Loki take their first steps towards the gods they would become. There's a very deft blend of action, drama, comedy, and high adventure, and I dug the voice acting straight across the board. There's nothing I can point to where Thor: Tales of Asgard got it wrong. I guess it's just that even with the war that's sparked between Asgard and the Frost Giants, it just doesn't have the heft...the size, the scope...I'd hope to get out of a movie. It plays like three episodes of a Saturday morning cartoon stitched together...three solid episodes, sure, but there's nothing all that sweeping or cinematic about it. Very good, not quite great, but still Recommended.